Stereoscopy.com - The Toy Shop. Welcome to the Stereoscopy.com Toy Shop. Please have a look at the following 3D-related toy items, 3D-viewers and other gadgets. Just click on the images to obtain more information or to order right away. Olympus puts a professional-quality digital camera in a small, beautiful package with the C-2000 Zoom. With amazing 1600 x 1200 uncompressed image capability, a 3x zoom, and a wide variety of manual settings, this tiny wonder is a great choice for everyone from travelers and families to graphics professionals. 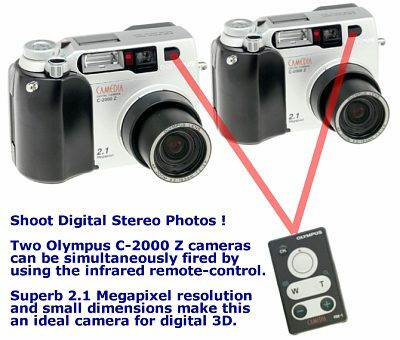 One of the most impressive things is Olympus C-2000 Zoom's compactness: it's one of the smallest digital cameras around. Its unique styling makes it look like a miniature SLR. It features a 1.8-inch LCD and takes four AA batteries. The Olympus C-2000 Zoom has one of the highest resolutions on the consumer market, at 1600 x 1200 dpi. It also lets you take images at 1024 x 768 and 640 x 480. In addition, you can take 1600 x 1200 uncompressed TIFF images--you can only fit one or two on a memory card, but when you need the absolutely best-quality image - such as for 3D-work in the studio - you'll want this feature. This camera has a great selection of manual options--it lets you adjust exposure, focus, and even the ISO film-speed equivalent. In addition to manual and auto exposure, it gives you shutter- and aperture-priority options. The C-2000 Zoom provides multiple flash modes (auto, off, fill-flash, slow-shutter synch, and red-eye reduction) and even lets you attach a separate flash unit. The Olympus C-2000 Zoom comes with an 8 MB removable SmartMedia memory card; you can buy separate memory cards in 16 and 32 MB configurations for plenty of picture storage. To take 3D-images of moving subjects, you will have to buy *two* of this camera, mount them side-by-side and fire their shutters simultaneously with the remote-control (included with each camera). Too much E-Mail from the Photo-3D Mailing-list? The Palm V Connected Organizer is a sleek new incarnation of the PDA that some claim has changed their lives. The software is basically identical to that of the Palm IIIx, but the physical unit has been significantly enhanced. At only 4.7 by 3.2 inches, the elegant anodized-aluminum case is far smaller and lighter than that of the IIIx. And at 0.4 inches thick, it's truly pocket-size at last. The Palm V also looks supercool, an intangible value, to be sure, but one that's hard to argue with. The new screen is far sharper than the IIIx, and contrast-variable backlighting makes it much easier to use in low-light conditions. Rechargeable lithium-ion batteries, which charge while the unit sits in its HotSync cradle, make battery life a nonissue. Connect the Palm V to your Palm V Modem and read your Photo-3D E-Mails "on the go" ...! Technology has moved in sometimes startling leaps and bounds since the View-Master's introduction in 1939, but nothing can take its place. The classic View-Master has been stylishly revamped in this model. With an overall curvy design and a wrap-around visor, this View-Master is comfortable to hands and eyes and has an image area 50 percent larger than the original. In addition, significant advances have been made in the View Master's visually stunning 3-D images. A window, located conveniently at forehead level, allows for easy reading of the captions that are included on each View-Master reel. In the age of information, this is one classic that is still going strong. One representative reel included. Looking more like a pair of binoculars (and there's a reason for that) than the View-Master adults might remember from their childhood, this new Discovery Channel View-Master delivers all the classic quality of the original. The three included reels show dinosaurs, and even a couple of paleontologists, in gloriously convincing 3D. The colors are clear and striking, and scenes (some with wonderfully eerie atmospheres) are set on ground and underwater with appropriate vegetation and landscape. Special insets give more information about each dinosaur, and a line of dinosaur silhouettes shows where the subject fits size-wise in the dinosaur family. These reels are a fitting accompaniment to Discovery Channel's Dinosaurs: The Real Story. For children without access to the Discovery Channel, the reels are fascinating enough to stand on their own. When children aren't viewing dinosaurs, they can turn a knob and change their View-Master to its binocular mode. A dial allows children to space the lens to suit their eyes, and then they're ready to view the world at four times regular size. Each package includes a 3D-viewer and 3 reels containing 21 3D-pictures. 3 reels containing 21 3D-pictures. View-Master Key Chain by Basic Fun, Inc. This palm-size version of the classic View-Master will make any keychain "reel" fun. Peer through a tiny mini-wheel hole, to see seven colorful pictures. Various reels are available, so collect them all. 1998's summer blockbuster, A Bug's Life, follows the fortunes of Flik, an ant whose obsession with labor-saving inventions creates a lot of trouble for his colony but ultimately saves it from a yearly tribute to a gang of rampaging grasshoppers. Now you can revisit the amazing computer-animated world of Flik, the Bug Circus, and the villainous Hopper (an insect with a serious attitude) with this collection of 21 3D stills from the film. Such scenes as the arrival at Bug City, the harrowing bird attack, and the defeat of the grasshopper gang have never looked more real--the View-Master will give you an ant's eye view of the world that you'll want to revisit again and again. Mulan is based on a Chinese fable about a young girl who is less interested in satisfying tradition and getting married than maintaining her family's honor. When the Huns attack China, a call to arms goes out to every village and Mulan's father accepts the call. Mulan steals her father's conscription notice, cuts her hair, and joins the army to fulfill her family's obligation and save her elderly father from certain death. This three-disk set takes the Disney animation cels and renders them in that simple version of 3D that most View-Master sets use. A good way to introduce the fable to younger viewers without the musical numbers and comedy routines of the motion picture. Viewer sold separately. Three-dimensional jellyfish and octopuses come to life with the help of View-Master Creatures of the Deep reel cards. Three cards come stored inside a handy carrying case that resembles a small, plastic computer disk storage box. The reels themselves can be dropped in front of a View-Master 3D-Viewer for children to watch stingrays float across the water before their eyes. The pictures are vibrant and multilayered, unveiling the murky world of undersea creatures. In addition, photos of the fish and wildlife are combined with fun facts in clear and simple words for young children. Put Flik and his friends on your walls, your ceilings, your brother's forehead with this View-Master projector. More of a toy than a projector (the projected image is difficult to see except in the dark), it's probably the most fun flashlight a kid can play with. A side rest is great for setting the whole thing down on a flat surface, it's easy to focus, and it's lightweight and portable. Takes any View-Master slide reel; three reels of the Pixar/Disney movie A Bug's Life are included in this set. They haven't messed with a good thing, just updated it. View-Master offers the exact same thrill you remember from childhood: your own private 3-D slide show, brought to you by the simple, classic design of the spring-lever viewer and the round picture disk. The Wild Safari set, part of View-Master's Discovery Channel series, comes with three disks that include pictures of giraffes, ostriches, wildebeests, water bucks, impalas, zebras, elephants, rhinos, bat-eared foxes, and more. Inset graphics let you know the relative size of each animal and offer extra nuggets of information, such as the fact that the bat-eared fox hears its prey better than it sees it. Viewer sold separately. The dinosaur set, part of View-Master's Discovery Channel series, comes with three disks that include diorama pictures of all the usual suspects--the T-Rex, triceratops, apatosaurus, stegosaurus--plus a few lesser-known critters like the tylosaurus. Helpful inset graphics let you know that the tylosaurus, which looks like a sturgeon with crocodile teeth, could have eaten both you and your rowboat for lunch. Viewer sold separately. View-Master 3-D viewing reels help kids discover fascinating images from the world around them. Whether from the Amazon rain forest or the savannas of majestic Africa, this Jungle Creatures three-pack includes a wide array of exotic wildlife. It comes with three collectible reels for use in a View-Master Viewer and a thin, handy plastic storage case. Children can learn about geckos, snakes, butterflies, monkeys, and more. Just drop one of the reels into the viewer and let them watch as images of animals and birds emerge in front of them. The images are bright and intriguing. Facts layered among the pictures make these reels all the more fascinating. Viewer sold separately. We can't all be lucky enough to live near construction sites, but now we can see the titanic machines up close with this View-Master set. Good old Cal from Caterpillar is your host on these three disks. Just slide them into your View-Master 3D-Viewer (not included) and you'll find 21 bright, bold images of tractors, bulldozers, and steamshovels doing what they do best: grading sand, moving rocks--whatever it takes to clear the way for building. 3 CAT reels in a package containing 21 3D-pictures. The pictures are very clear on the view master and show different aspects of car racing. The color and clarity are excellent. It's prom time for Barbie and she's double dating with her best friend. Now, with this View-Master set, all of Barbie's loyal fans can watch Barbie and friends shopping for clothes, preparing for the prom, and dancing the night away. The set includes a pink, 3D View-Master and 3 collectible reels with 14 full-color, 3D pics of Barbie and friends on each. That's 42 scenes of Barbie's big date, including a richly detailed shopping spree where dazzling gowns and sleek tuxedoes stand out in 3D sharpness. After a stop for snacks in the mall, Barbie and her entourage get ready for the prom. Barbie is, of course, crowned Prom Queen, and the romantic evening ends on that high note. Copyright © 1999 by Stereoscopy.com and Alexander Klein. All rights reserved.